Turn an agenda faceup and install Transparency Initiative on that agenda as a hosted condition counter with the text "Host agenda gains public. Whenever you advance host agenda, gain 1credit." Can the Corp install Transparency Initiative on an already faceup installed public agenda? No. If no agenda is turned faceup, then Transparency Initiative can't find "that agenda" to install itself as a hosted condition counter. If you want to FA using Dedication, you want two things: a 5/3 (because scoring anything else with that much effort is not really that conductive to winning) and a way of turning an agenda face-up. Currently, there are two. Casting Call in NBN and Transparency Initiative. And, sadly, Transparency is massively worse, because it does not cover the click-cost of installation, unlike Casting Call. With CC, you can do stuff such as installing a bit of ICE click 1, then Casting-Calling/Dedicating click 2 and 3, for a very up-tempo play. TI does not allow that - furthermore, it is not even that fast. Compared to just installing and advancing manually, it only saves you one click (unless you are playing more than one Dedication Ceremony, that is trying to push through a Government Takeover through a remote, which is a beautiful, but a bit overly risky thing to do). This makes this card incredibly slow compared to CC. Furthermore, its credit-refund ability does not work with Dedication, which basically means that you are spending a click to turn an agenda face-up. Therefore, pretty much any Weyland deck trying to go for Dedication FA - which isn't that stupid of a strategy - should just stick to CCs, which not only are more click-efficient, but also give a measure of protection to your agenda. However, there is probably some home for TI as a one or two-off in such a deck to cover situations where you don't have a CC in hand, but have a Dedication and just want to push through an agenda ASAP, and this allows you to turn it face-up after installing in case of wanting to dedicate more. This is extremely fringe, but does happen in Dedication decks (and I speak out of experience: I've been playing FA BABW extensively for past few months); however, aside from that one scenario, Casting Call is just better, influence be damned. FA decks cannot allow to slow down, and Transparency Initiative does just that - slows them down. Pair with Mumbad Construction Co. for a three click (and pretty expensive) combo capable of scoring any sized agenda, given enough build up (this helps). Why would you use this over the undoubtedly more dangerous and useful Casting Call? Influence costs of course. CC is two, which isn't huge, but it sure isn't a one. Probably useful in a Gagarin deck, and not much else at the moment. 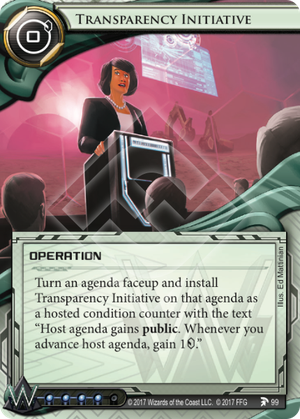 Ok, so in order to use this you have to install an agenda in a really secure server, you then have to have Transparency Initiative in hand and spend a click to install it on the agenda and then you get a credit whenever you advance an agenda (cards that just place advancement tokens on it don't count). And what's the payoff? The biggest cost for an agenda at the moment is Government Takeover at 9 counters. Now getting 9 credits is certainly nice but if you advance normally that means the GT is on the board for 3 runner turns (first turn install, play Transparency Initiative advance; second turn advance to 4; third turn advance to 7; fourth turn score). Shall we just put that one down as jank? For a more normal agenda it's actually even worse. Take a 5/3. Normally you can play that with normal advancement in two turns (IAA, AAA). With Transparency Initiative you need an extra click so the agenda remains on the board for 2 runner turns. And for all that risk you get 5, the same as IPO gives you. Because Transparency Initiative is installed on the agenda it gets trashed when you score the agenda, you can't reuse it. Another downside. Transparency Initiative, with it's added downside of having to install it, doesn't even give the same amount of credits as Oaktown Renovation does. Oaktown gives you 2 per advancement and a whopping 3 per advancement if you overadvance the agenda. I guess this will be my nomination for worst card of the set.